Prince George’s County Executive Rushern Baker’s endorsement of Rep. Chris Van Hollen over Rep. Donna Edwards for U.S. Senate shows the tough road ahead for Edwards as the primary contest progresses. Not all endorsements matter. This one does. While Van Hollen has the united support of the Montgomery County Executive and County Council, Edwards just lost the most prominent local official in her home base. 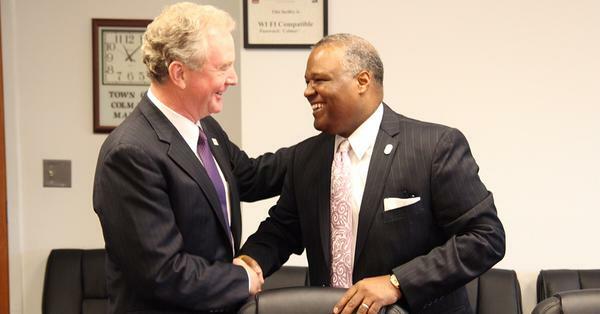 Van Hollen has easily consolidated political support in his home base. In contrast, Edwards has now been served notice that she will have to fight hard to get Prince George’s to swing behind her. It reinforces the existing media narrative that Edwards doesn’t work well with others either in Maryland or Congress. Moreover, it serves as a powerful signal to other African-American officials that it’s OK to endorse Van Hollen over Edwards. A further subtext is that Baker thinks Van Hollen will win so you should support early. Edwards will try and counter as the authentic progressive candidate running against a corrupt establishment as when she challenged successfully Al Wynn. Except that she’s now a Member of Congress and part of the establishment so people want to see effectiveness as well as an ability to speak truth to power. Moreover, neither Van Hollen nor Baker are Wynn. Both have strong reputations of wanting to clean up politics. Van Hollen, for example, has been a champion of campaign finance reform. The insufficiently liberal narrative won’t work on Van Hollen either and may just end up reinforcing that Edwards is less electable. If Elijah Cummings enters the race, this can’t hurt him either, as it makes it easier for him to reach out to Prince George’s. In short, Cummings looks to have an easier time making inroads into Edwards’s base than vice-versa. California Rep. Darrell Issa (R), the Chair of the House Oversight and Government Operations Committee, tried to silence Maryland Rep. Elijah Cummings (D), the Committee’s Ranking Member. Big Mistake. Kudos to Cummings for standing up to a bully uninterested in the truth.